I twisted my husband's arm again today - field trip to Lancaster. 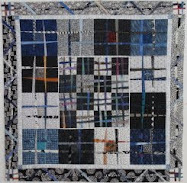 I need to get my bearings for the upcoming AQS Quilt Show - review the best route into town, identify parking locations and hone in on some good local eateries. The show runs March 24 - 27th - make sure it's on your calendar! It's a Saturday, so our first stop was Lancaster's Central Market - the country's oldest farmer's market, pictured below - the building is beautiful. When I first started coming to this market I expected all Pennsylvania German vendors, and an older crowd, thick with the local accent. I was completely surprised to find a multi-ethnic market and a very young clientele. 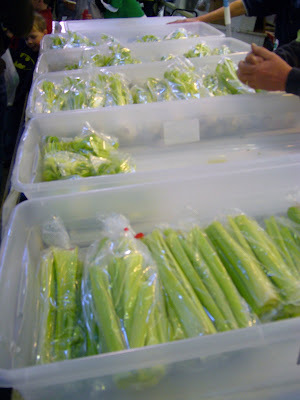 One of my favorite stands at the market is the celery stand - all they sell is celery - and, yes, it does taste better than the standard store bought celery. 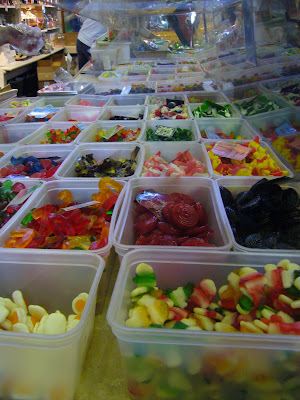 I took this picture for Cheryl - look at all of the jelly candies! Mmmmmmm! Calorie free if all you do is look! The market is open Tuesday, Friday and Saturday - make sure to put an ice chest in the car if you're planning to stop while you are at the AQS Quilt Show. 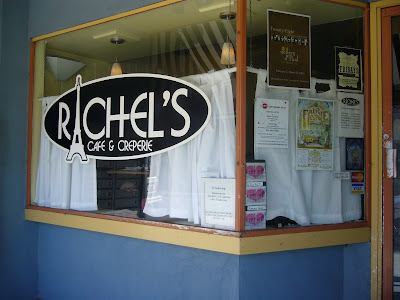 After we stashed our goods in the car (in our snow filled ice chest) we were off to lunch - this visit we tried Rachel's - a lovely little creperie in the Uptown section of Lancaster, a quick walk from the market at 309 North Queen Street. We had a very satisfying lunch of crepes - definitely recommend it for lunch. 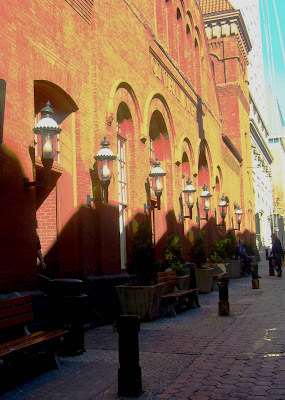 Now onto Gallery Row, on Prince Street. 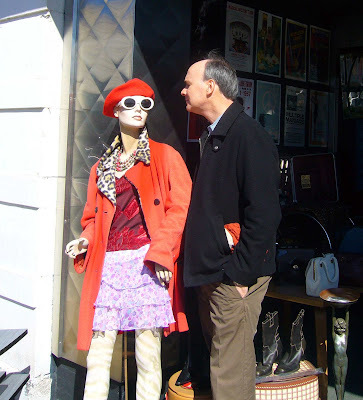 Honey - come on, stop trying to pick up the mannequin --- men! 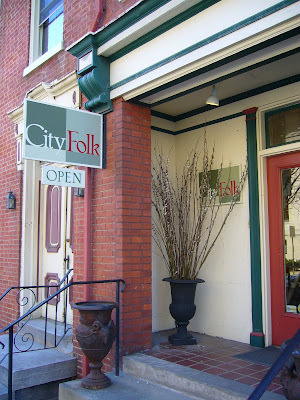 Our first stop was City Folks - beautiful home store!!! This is a pillow I saw in City Folk - it was made by a local artisan - Christine Morgan. I've googled her but cannot find any info for her. I recommend a quick stop at City Folk just to see this stunning pillow - it is quilted and chenilled - and this photo does not do the colors justice. 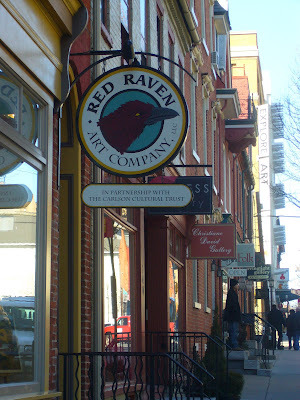 Our next stop was the Red Raven Art Company - a beautiful art gallery. I was captivated by the work of Art Harrington - a local artist who is currently being featured in the gallery. His farm / barn series is a fresh and contemporary view on the stunning landscape of Lancaster County. He works in two completely different techniques and his exhibit gave you a sampling of both. His use of color is captivating. Last night was First Friday Gallery Night in Lancaster - wish I would have been there to meet the artist. A quick dinner tonight - one of our favorites - reminiscent of a French bistro. A bed of mache and radicchio topped with crisp bacon lardons, potatoes and carrots fried (shhh!) 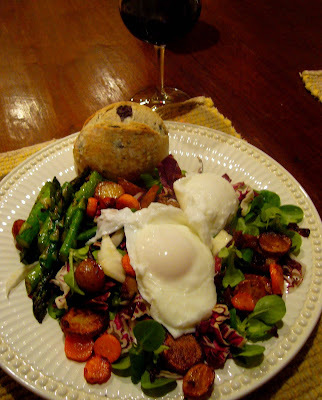 in the bacon fat, pan roasted asparagus, dressed lightly with a shallot vinaigrette, and topped with poached eggs - a crisp rosemary and olive roll and a glass of zinfandel - perfect. Tomorrow - off to Brooklyn!